Lucas di Grassi began karting in 1994 and within three years was already winning championship races, before working his way to Formula 1 with the Virgin F1 Team. He has raced in Formula E from the very first race in Beijing onwards, and played a key role in the early stages of the series as he helped developing the original spec car. Furthermore, he is working with Roborace, also helping them develop their first car just like he did for Formula E. He also made history in the end of 2016 when he drove the Formula E car on the Arctic Ice Cap. Di Grassi made his racing car debut in 2003 driving in the South American Formula 3 series and finished second in his debut year. He switched to the British Formula 3 Championship the following season and took two victories on his way to eighth. 2005 saw him move to the Formula 3 Euro Series where he finished third as well as claiming victory in the annual Macau street race. In 2006, the Brazilian began the first of four seasons in GP2, racking up numerous wins and podiums as well as acting as third driver for the Renault F1 squad. In 2010, he finally got his break with his rookie season in Formula 1 for Virgin where despite car issues, he recorded the team’s first race finish with 14th in Malaysia before going on to beat team-mate Timo Glock in the championship standings. 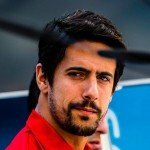 Since then, di Grassi has acted as a Pirelli F1 test driver and enjoyed success in the FIA World Endurance Championship with Audi, including a podium on his debut at the famous Le Mans 24 Hours in 2013. He was named one of the development drivers for the FIA Formula E Championship before being announced as a race driver with the ABT squad ahead of the inaugural season.